returned to the public eye Monday after about a year and a half since a jury found her not guilty of killing her 2-year-old daughter. A judge ordered Anthony to attend a bankruptcy hearing with her creditors Monday afternoon at 1:30 p.m. in Tampa. hidden entrance. The arrangement was changed and she was walked through the front door instead. The source said Anthony was crying and very upset after her arrival. One protester yelled “baby-killer,” as she made her way into the federal courthouse. Last week, the judge denied a request to move the bankruptcy case to Orlando. In court, Anthony sat between her three lawyers and answered questions calmly to the bankruptcy trustee. September 2012 and then sold the photos. Anthony said she has not had any movie, interview or book offers, although her lawyer Charles Greene said that she had offers three weeks ago. During the 40-minute court session, it was revealed that the debt of $500,000 to Baez stems from an original retainer agreement with him, but she said she doesn’t believe she still owes him. She also told the court she had no car, no job and no diary. The reason she decided to file for bankruptcy is because Anthony said there was delay in the trial with her and Gonzalez, and that she needed closure. The session became tense when Zenaida Gonzalez’ attorney, Scott Shuker, turned the session into an apparent cross examination. “It’s not about taking a breath. What you are doing is improper,” said Shuker. After the session, Shuker said that Anthony’s answers do not “pass the smell test.” He said his next step is to take a deposition of her. Gonzalez’ attorneys said they oppose her want to discharge her debts. Neither Anthony’s parents nor Baez were in court Monday afternoon. Attorneys for Gonzalez and former meter reader Roy Kronk are both suing Anthony. Her bankruptcy filing effectively blocks the two lawsuits from moving forward. Cameras were not allowed in the courtroom. With the Lifetime Movie coming on soon, True Crime With Aphrodite Jones on Investigative Discovery channel is putting in their two-cents. I believe Casey should take a long walk off a short pier, and she got away with murder. Giving this obvious attention seeking whoreish behavior attention is sort of like giving your 2 year old a sucker after they threw a 30 minute tantrum. She goes through the various lies Casey told and interviews Casey’s lawyer Jose “Bozo” Baez. I’m not sure what I’m more queezy about: Casey’s lies, Baez interview or the seriously awful reenactments. Baez says Casey lived in a fantasy land, and if your 3 years old with imaginary friends that’s ok, but in her case it just wasn’t. Well hello captain obvious! -Baez graduated law school in 1997, but wasn’t accepted into the Fl bar until 2005. In part this was for failure to pay child support. -Caylee’s body was found less than 1/2 mile from the Anthony home. -Judge Strickland, who had to recuse himself from the case said he does not believe the case was overcharged. -Baez said his biggest fear was losing Casey to the death penalty. -Alot of people believe Baez was not equipped to defend Casey. -The duct tape found on Caylee’s mouth was manufactured in Ohio and found in the Anthony home. -Baez believed “the smell evidence” was junk science. -Baez says this about the day Casey told him “the truth” about Caylee dying (drowning in the swimming pool) : She wanted to tell me so bad. When she did I could see she felt relieved. We locked eyes and she told me point by point what happened. It was a different Casey that day. She was bearing her soul. 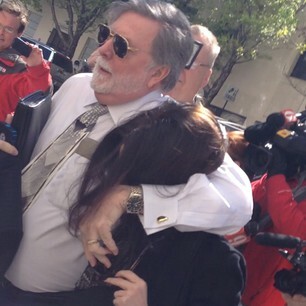 -Part of the reason she was acquitted: We don’t know how Caylee died. -Jones says after analyzing this case, the jury made the right choice, but shes still angry when Casey is back in the media. -January, 2012 a video diary “leaked” onto the web. Baez claims it was accidental. -“So many “secrets” in that family, its believable that George may have been involved.” Quote from Jones.